Here is a cat snowman with his tongue out thinking about the cardinals around him. 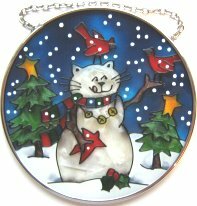 Made of hand painted, lead-free glass, this sun catcher is 3 5/8" high x 2 5/8" wide. Chain for hanging. Boxed.